From 1770 to 1789 a succession of highly publicized cases riveted the attention of the French public. Maza argues that the reporting of these private scandals had a decisive effect on the way in which the French public came to understand public issues in the years before the Revolution. 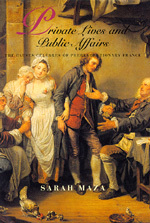 Sarah Maza is Professor of History at Northwestern University and the author of Servants and Masters in Eighteenth-Century France: The Uses of Loyalty (1983).